Thank you for videotaping "Dharma & Greg" and freeze-framing on my vanity card. I'd like to take this opportunity to share with you some of my personal beliefs. I believe that everyone thinks they can write. This is not true. It is true, however, that everyone can direct. I believe that the Laws of Karma do not apply to show business, where good things happen to bad people on a fairly regular basis. I believe that what doesn't kill us makes us bitter. I believe that the obsessive worship of movie, TV and sports figures is less likely to produce spiritual gain than praying to Thor. I believe that Larry was a vastly underrated Stooge, without whom Moe and Curly could not conform to the comedy law of three (thanks, Lee). I believe my kids are secretly proud of me. I believe that if you can't find anything nice to say about people whom you've helped to make wildly successful and then they stabbed you in the back, then don't say anything at all. I believe I have a great dog, maybe the greatest dog in the whole wide world, yes, he is! I believe that beer is a gateway drug that leads, inevitably, to vodka and somebody oughta do something about it. I believe that when ABC reads this, I'm gonna be in biiiig trouble. I believe that Tina Turner's "River Deep, Mountain High", is the greatest rock song ever recorded. Once again, thanks for watching "Dharma & Greg". 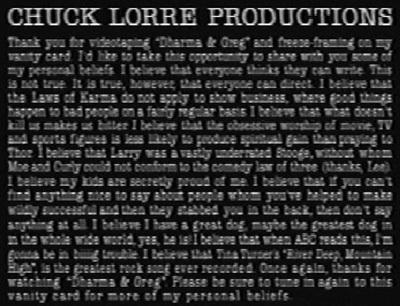 Please be sure to tune in again to this vanity card for more of my personal beliefs.